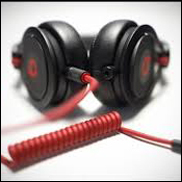 MEW YORK (Hypebot) – News broke over the weekend that the NFL is banning Beats Headphones on TV as part of their deepening relationship with Bose. Actually it's a little unclear exactly what they've banned. Everyone's referencing Re/code whose coverage is somewhat ambiguous. My reading is that the NFL has banned Beats Headphones during televised interviews including in the background but most are taking it to mean a total ban on Beats Headphones on the field. "Kaepernick and other NFL players must remove their Beats headphones around the television cameras." "conducted during pre-season training camps or practice sessions and on game day — starting before the opening kickoff through the final whistle to post-game interviews conducted in the locker room or on the podium. The restriction remains in place until 90 minutes after the play has ended." Given that "around the television cameras" is pretty damn ambiguous, it appears they have a ban on Beats Headphone wearing during TV interviews including anyone else wearing them in view of the cameras during the interview. I have yet to see any coverage that wasn't just a rewrite of the Re/code article. If you see something that references an official source and says otherwise, not just a big media brand with a statement that says otherwise that isn't an NFL quote or something more concrete than we currently have, please pass it along. Until then it looks like most coverage of this is inaccurate and/or Re/code just didn't tell us the full story. For its part, Beats is playing defense (or setting up their offense) with chatter about "athlete DNA" but they'll probably win anyway just like they did during the World Cup ban.